In 1998, Joey Tensley launched Tensley Wines, a winery in Santa Barbara County, where the mountain range runs from east to west. Eager to let the vineyard speak for itself, Joey produces vineyard designated Syrah wines that from day one, have been well received on the market. 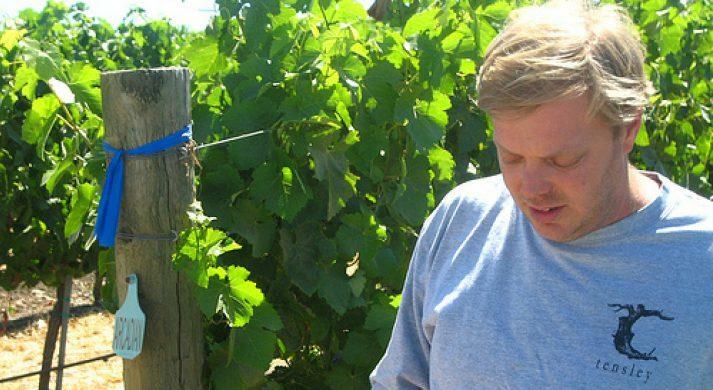 For his first vintage, Joey produced 100 cases, while serving as the assistant winemaker at Beckmen Vineyards, where he was given space to launch his own label. Three years later, in 2001, Joey relocated to Buellton, CA to open his own winery, producing 750 cases of wines that immediately appeared on some of the country's top wine lists. This same year, Matt Kramer added two of Tensley's 2001 Syrah wines to the Wine Spectator's Top Ten Wines in the World list. An auspicious beginning for a young vintner? Absolutely! But it was also an incredibly solid foundation that followed with framework in the form of 90-95 point scores from Robert Parker for Tensley's 2001-2004 vintages. Thirteen years later, Tensley currently produces 3,300 cases a year. Taking advantage of the many micro-climates that the Santa Barbara mountain range provides, Joey cultivates his Chardonnay and Pinot Noir in areas that are close to the ocean, while growing his Rhone varietals--Syrah, Grenache, and Viognier--further inland.